Bliss! A lovely, quiet, nothing-to-do and nothing-on-the-calendar Sunday . . .
Well, that's until Aunt Susan - an unstoppable force - is on the phone insisting that Harry and his family come down to help her a local event she's promised to organise: the Great Toadpool Show. It means swinging from a trapeze. Or walking on stilts . . . Even riding a unicycle . . .
And that's not counting the fortune-telling tent, the tombola, or the choir singalong . . .
Aunt Susan has no idea of the mayhem she's about to unleash. "Fans of Eating Things on Sticks and The More the Merrier will already know this former Children's Laureate's talent for family farce. Here, the Mountfields comprise sparring brothers Ralph and Harry, roguish uncle Tristram, relentlessly organising aunt Susan, hopelessly impractical uncle Digby, a lisping Infant Phenomenon, and evil Great Granny who scolds songbirds and gives children 'the sort of look that makes your socks catch fire'. Summoned by Susan to perform circus-style acts at a village fete, the family survives comical mishaps, in an enjoyable blend of adult knowingness and subversive silliness, enhanced by expert illustrations by Kate Aldous that fit the story scrupulously." "Things work out, of course, but not in the way you might have expected - which is all part of the fun in a comedy of this sort. Anne Fine is the kind of writer who creates great characters and puts them through their paces in scenes constructed so well you can't see the joins. She's also a keen observer of human nature - 'peeling back the nice surface of family life to show what's underneath', as it says on her website. 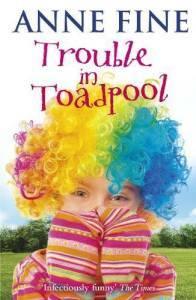 Some of her other work is very dark, but for all its chaos Trouble in Toadpool feels rather sunny." Some characters are such fun to write about that you hate to see the back of them forever. I adored writing The More the Merrier (all that fuss around Christmas made into one long joke). So then, in Eating Things on Sticks , I brought a few members of that mad family back again, to tell the chaotic story of their summer holiday on some grisly bleak island where pretty well everyone had a beard - even the women. But now all the rest of the Mountfields seem to have been knocking on my door again. I wanted to write more about Ralph and Harry's terrifyingly rude and witchy Great Granny, their horribly bossy Aunt Susan, their irresponsible Uncle Tristram, and of course their extraordinary cousin Titania in her little cream puff frocks. And where better to have Titania reciting her ghastly tear-jerking poetry than on the stage of the Annual Toadpool Show? It's such a pity that - as usual when the Mountfields are about, everything - just everything, goes wrong. Order the original hardback edition - or ask your local bookshop or library to order you a copy (tell them the ISBN is 978-0-8575-3063-9). Or download the Kindle edition from Amazon.